Krishanthi Williams is a photographer providing amazing contemporary wedding photography services to lucky couples getting married within the London area. Having built up a good level of business through recommendations and word of mouth Krishanthi came to me as a referral from another of my SEO clients looking to expand her online presence and to build up more web generated business. Krish chose a website style and format that would showcase her images the most and as she works in an industry in which a photo can tell a thousand words, Krish was specific about what she wanted and where. As a result of her pro-activity Krish was amazing to work with and is now an eager blogger who took a great deal from her WordPress training an I am now very much looking forward to working with her as we begin stage 2 – the SEO of her website! To see Krish’s work visit her site at www.photographybykrishthanthi.co.uk. Jelly Beans Parties is a children’s party entertainment service specialising in providing themed entertainment for a range of children’s parties including birthdays, christenings, general celebrations etc. As a new venture, everything about the site was fresh and new and the website design and colours were based around an existing logo. Jelly Beans Parties are based in London and have a clean and easy to navigate website with a blog and contact form. More information can be seen at the site www.jellybeansparties.co.uk. 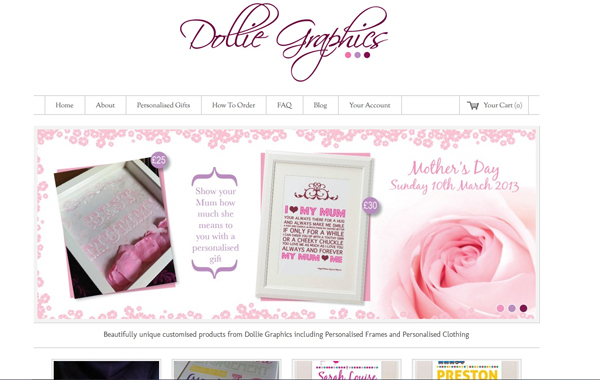 Dollie Graphics is a boutique online store specialising in personalised gifts of all sorts. The owner Sarah Irving is a graphic designer and has put her talents to amazing use by offering a wide range of personalised products on her site including personalised frames, keyrings, cards, magnets, clothing and more. Being flexible, she is open to hearing about what you’d like to see on a product and will work with you to design the perfect gift. She’s also my sister and so gets the highest degree of praise! Our house is full of her products and I can’t recommend them highly enough! See more and order now (!) at www.dolliegraphics.co.uk. The e-commerce areas of the site are still under construction. 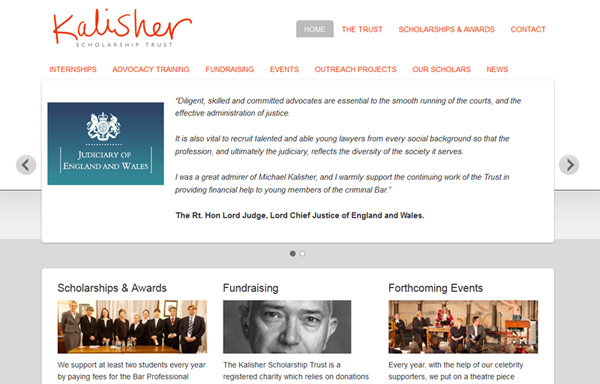 The Kalisher Trust is a registered charity that provides financial help to those looking to undertake the Bar Professional Training Course (BPTC). As a year long course the costs of this can be up to around £14,000. The Trust exists to help those less fortunate to begin a career at the Criminal Bar. Having been set up in 1996, The Kalisher Trust runs on donations which are generated through a number of means including theatre events, lecture evenings etc. I was asked to build a website that served to expand on the information available online about the trust. This was a straight-forward SEO website build. More can be seen at the site: www.thekalishertrust.org. My Baby Spain is one of my own websites set up when I found out I was pregnant with my little boy. As there was a good chance that he might be born in Spain, I set the website as a way of researching and finding out the answers to all the questions I had about having a baby in Spain. 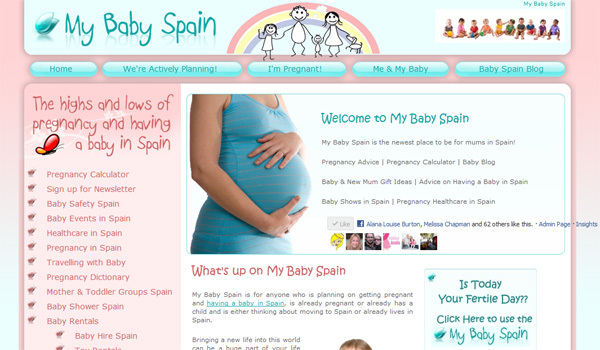 My Baby Spain is now a sizeable website that ranks top for a range of baby Spain related keywords. It also has a healthy Facebook community and Twitter following. 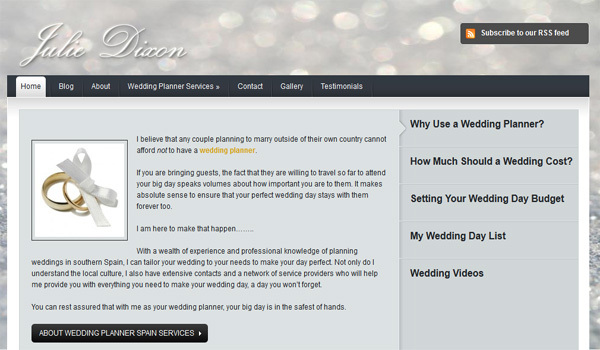 Julie Dixon is a wedding planner in Spain and wanted a website built to promote her wedding planner services within Spain and specifically around the Costa del Sol and surrounding areas. I worked with Julie Dixon to build an SEO website in WordPress that included information on all services offered, video footage showcasing examples of her work, a functioning contact form and a blog. Work also included training on how to maintain the website and how to blog. 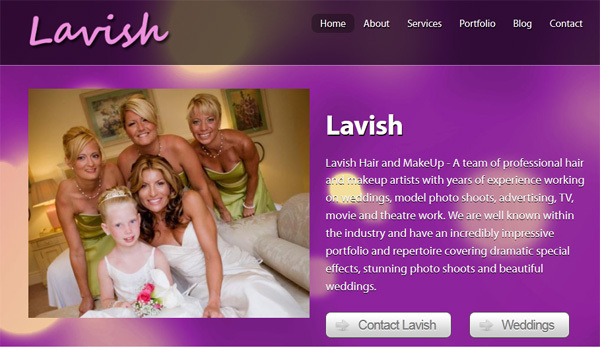 Lavish Hair and Makeup is run by mother and daughter team Diana Churchill and Jess Churchill, based on the Costa del Sol. Diana is a hair and makeup artist with years of experience specialising in weddings, advertising, TV, theatre and general photo shoot work. As a freelancer Diana was looking to have a website built to increase her online presence and to futher promote her services. Jess and Diana specialise in wedding makeup Spain. The Lavish website was built in WordPress, a leading blogging platform and training was done to empower Diana and Jess to update a latest news section on the website for themselves. The website ranks top for a number of keywords and has lead to an increase in business for Diana and Jess along the Costa del Sol as well as Europe-wide. 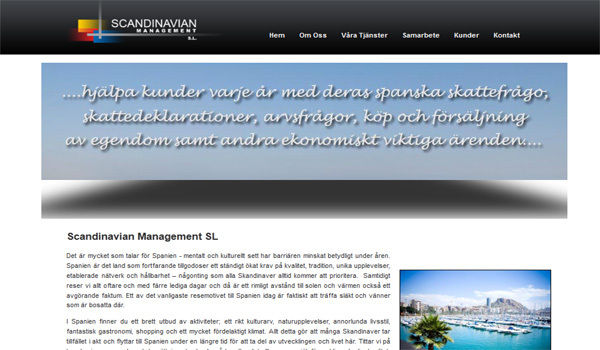 Scandinavian Management was the first website built not to be in English! As a new challenge, scandtax.com was built just in Swedish and Norwegian. Without a single word of Norwegian nor Swedish in my repertoire, building a website in the 2 languages was a new challenge for me and even helped me learn a few words of a new language! Clearly the lack of native proficiency has an effect on the SEO implications and so the website build was the primary objective. Using the website content and titles the meta data was put together to go a little way to providing relevant SEO data. The objectives in this case were to take an old fashioned and outdated website into the 21st century with a fresh and modern look. Onsite Business Solutions S.L. is a business outsourcing consultancy that provides help and assistance to all sorts of businesses in a range of areas to help them achieve their goals. 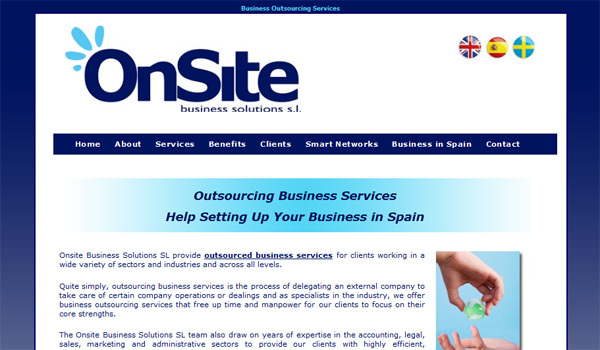 Specialising in providing help to Scandinavian companies to set up ventures in Spain, the Onsite Business Spain website was built in 3 languages, English, Spanish and Swedish. Having taken German and Spanish at university there wasn’t a problem in administering Spanish SEO to the Spanish pages but Swedish SEO required a great deal of coordination with the company owner to ensure the most appropriate content and meta data was being used.Work undertaken included the website build and initial SEO training and consultancy to provide the website owners with enough knowledge to maintain website content and be able to direct the website to future success. You can’t not build a website for your brother when you’re first putting them together! 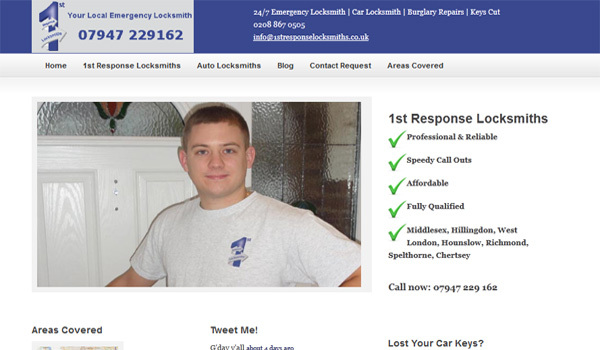 I have built 2 websites for 1st Response Locksmiths www.1stresponselocksmiths.co.uk and www.your24hourlocksmith.co.uk. As the older website of the 2, your24hourlocksmith.co.uk has helped 1st Response Locksmiths grow from a fledgling business to a highly lucrative business venture bringing in lots of car locksmith work. Ranking well for a range of locations in which his services are offered, the 2 websites have been built in different ways and work completed on them has over the years covered a bit of most areas of Internet Marketing! Currently we are working towards 1stresponselocksmiths.co.uk achieving the same success as the lead generation website your24hourlocksmith.co.uk.